We bought a portable air conditioner to get us through a miserable record-breaking summer and tide us over until we could see if we could get central air conditioning installed in our old house. 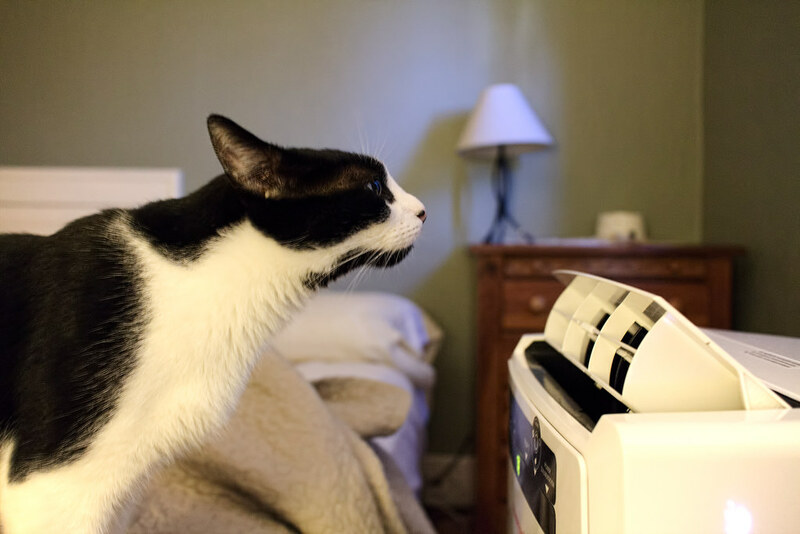 Boo loved to stick his face into the stream of cool air flowing out of the vents, although I’d guess he was drawn more by curiosity than a need to cool down. We spent so much time in our little bedroom that I almost came to view the air conditioner as a member of our family. While not a large room, it did a fine job keeping the room cool even when it broke 100 degrees outside and despite the body heat from two adults, our black lab, and three cats. I tried all summer to get this picture of Boo and this was the best result, although it isn’t sharp. I had to move quickly and in the low light my camera usually couldn’t focus fast enough, and if it did because I had to hold the camera out to get the framing I wanted, camera shake made the picture blurry (which is what happened here). Plus the sickly light from the fluorescent bulb in the lamp isn’t that pleasing. That said, I love the picture and it makes me smile. Today’s title is a reference to Miles Davis’ groundbreaking album Birth of the Cool. 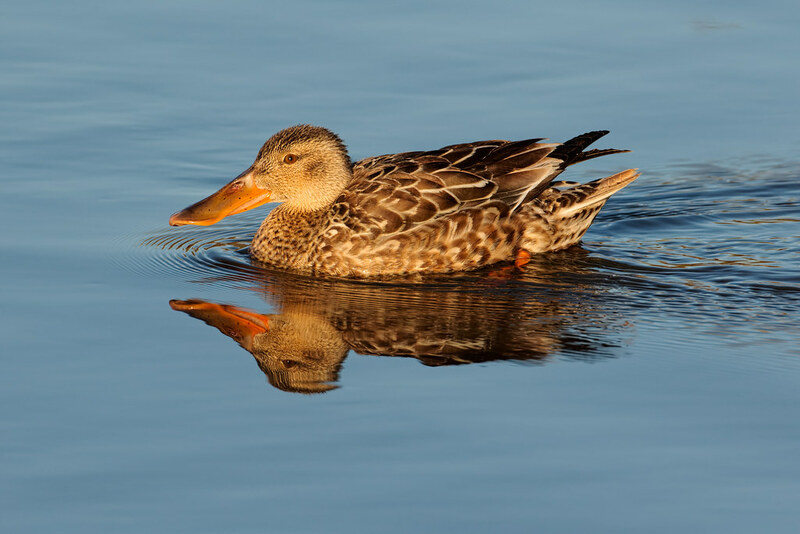 A shoveler swims past late in the day on New Year’s Eve of 2014, meaning she likely survived into the new year. 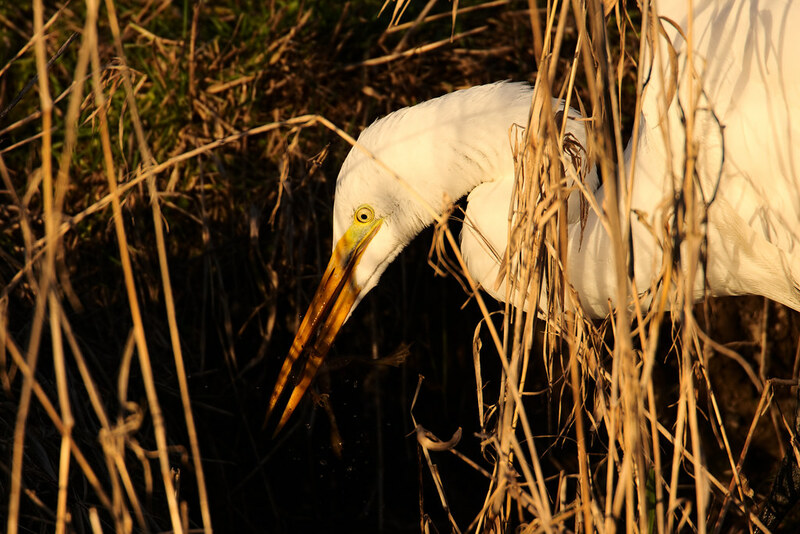 The little bullfrog below almost made it into the new year but an egret plucked it from the shadows shortly before sunset. The bullfrogs move pretty slowly in the cold of winter and if spotted are easy pickings for the egrets and herons and bitterns that patrol these shores. It was a major effort to get Boo to accept Trixie, but eventually he not only grew to tolerate her but now even enjoys playing with her. 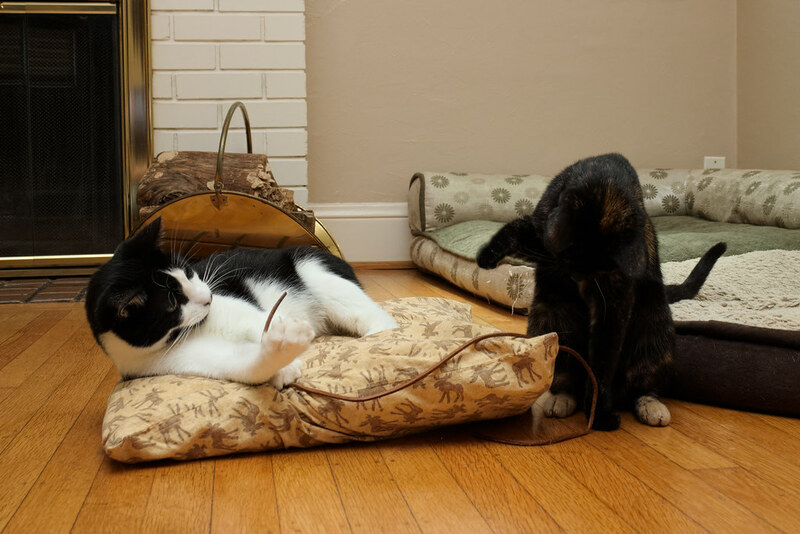 Here they’re goofing around with an old leather shoelace. A few weeks back I had the worst nightmare I’ve ever had. The earth was going to be destroyed if I didn’t kill Boo and Trixie. They didn’t just have to die, they had to die at my hands. I learned from my mentor that the needs of the many outweigh the needs of the few — or the one — and since their young lives were forfeit no matter what I did, I agreed to do it. I picked them up and held them in my hands. They gave no resistance. But I couldn’t do it. I would give my life but I wouldn’t take theirs. I don’t remember anything else, so presumably the earth was destroyed by whatever malevolent force threatened it. Sorry about that. A couple of weeks later I had the gentlest nightmare I’ve ever had, consisting of me walking around with my pants pockets overstuffed with pennies. That was the entirety of the horror of the dream, me walking around with jingly-jangly pockets weighed down with worthless currency. As much as I hate pennies, that’s a pretty easy cross to bear. One of the things I love about the Canon M is how quiet and unobtrusive it is, which makes it a lot easier to take pictures of the pets without alarming them — despite what Sam’s appearance might suggest. 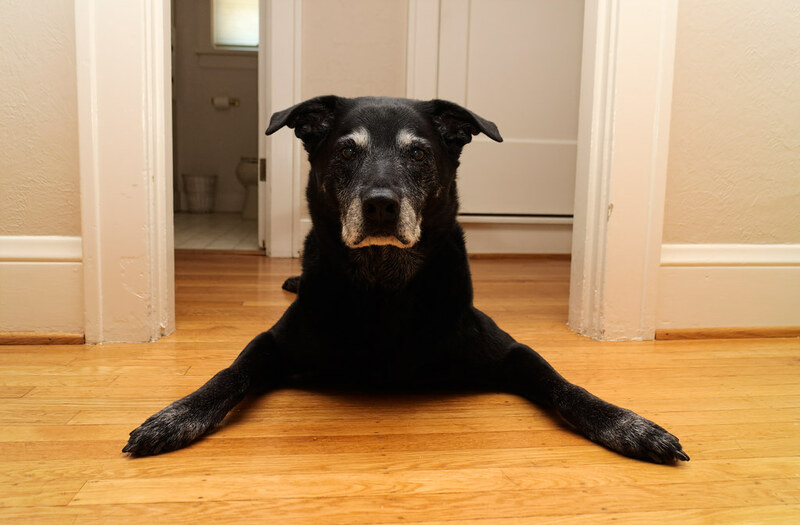 The reason his eyes are wide open and his ears pinned back is that it was nearly dinner time, and he heard a noise downstairs and was at full alert to determine if he was about to be fed, with his ears angled back to pick up any noise coming from beyond the door. He had been curled up in my lap and kept hinting that it was time to be fed, starting about two hours before his actual dinner time. That’s Trixie back there on the bed, we were all hanging out in the room with the air conditioner with the door cracked open so the cats can come and go. Another nice thing about the M is I could put it down by my side to take the picture, so that I could include not just Sam’s hilarious expression (he was staring at the wall, not at me), but also my legs to show he was curled up on my lap, Trixie as a reminder we were all up there, and the slightly open door to show the real reason he was on Red Alert. This record-shattering summer gave us one last weekend of cruel, hot weather and we had to retreat to the bedroom once again, but this picture is from a month ago. The weather was much cooler today and should stay nice from here on out until we are firmly in fall’s embrace. 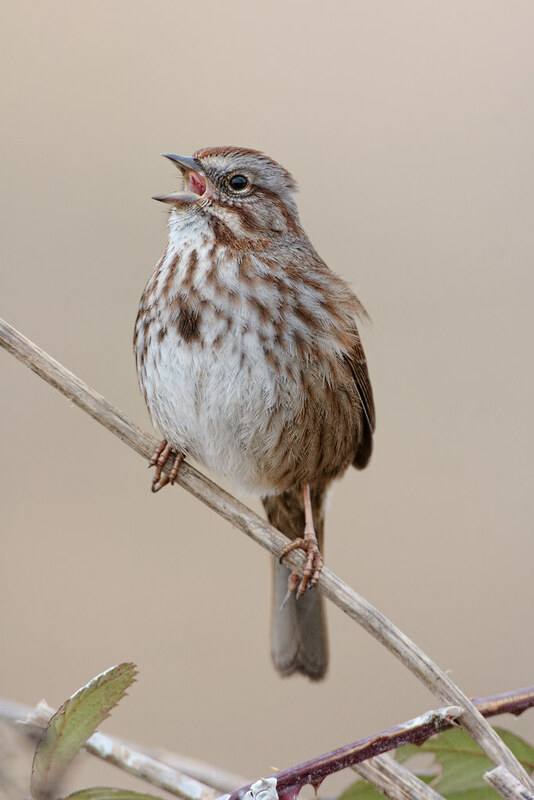 A song sparrow sings on an early March morning. You can see some bird droppings on the blackberry below it, suggesting this is a favorite perch, as birds often eliminate their waste before taking flight. I was photographing our cats Boo and Trixie playing together when I noticed Ellie patiently waiting in the doorway behind me. She looks so sad when her mouth is closed, so I got some treats hoping I could convince her to give me a big smile. However Ellie is serious about food and instead of a smile I got an intense stare.